A small controversy has been blowing around the Con sphere these last few days, picking up enough momentum to outrage attendees everywhere. I wanted to stay out of this because I know some of the people involved. But everyone has been asking me about it so here it is. Phoenix Comicon is making its volunteers pay for the privilege - sort of. Essentially, to volunteer at Phoenix going forward, you'll need to be a member of local organization Blue Ribbon Army, which costs a minimum of $20 a year. (PHXCC director Matt Solberg is on Blue Ribbon Army board, if you're wondering what the connection is. That's part of the debate.) Joining BRA doesn't guarantee you a volunteer position, either; it just makes you eligible to volunteer. Virtually 100% of the Phoenix attendees/past volunteers I've spoken to feel negatively about this. So is this unfair and horrible or is it a reasonable solution to what PHXCC says is a real problem - people abandoning their volunteer posts and burdening their fellow volunteers? Here are the factors in play so you can judge for yourself. Joining the Blue Ribbon Army doesn't mean you get to volunteer. It just puts you on the list. In fact, while there will be about 1300 volunteers for the 2017 Con, they are hoping to only need 950 for 2018. But joining BRA isn't just about volunteering. You pay to join a non-profit organization (a fan organization turned social club) and enjoy benefits beyond just the eligibility to volunteer - early access to hotel reservations and the BRA lounge, entry to other events, for instance. 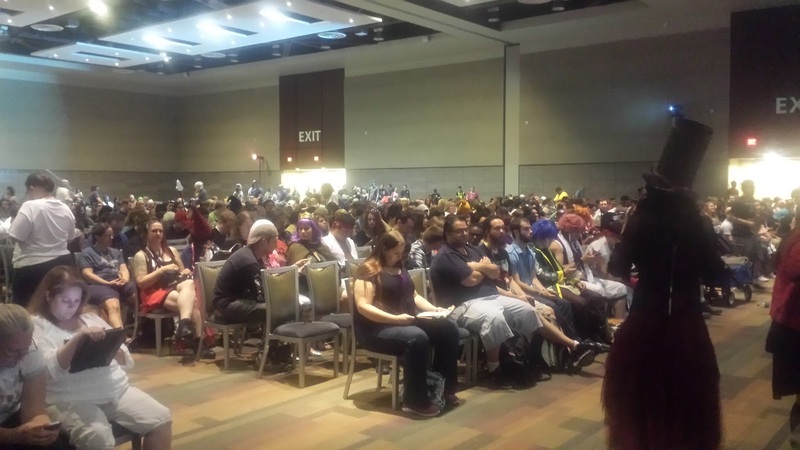 Much coverage of this kerfuffle has positioned Phoenix Comicon as a top Con. I'm going to say that it's not. The attendee numbers may be respectable (106K in 2016) but I feel that's because it's in a city where not much happens, especially for nerds; also it caters to a younger demographic (I've never seen so many high school attendees at any other Con) by offering tons of events while offering limited panels of substance. The numbers may be there but the offerings aren't, not in my book. I felt the same way about Alamo City Comic Con, as well as other Cons that manage to draw in half the city without offering the type of talent you'd see at SDCC or NYCC. I am not saying that's bad, because obviously these Cons are delivering something great for the people who love them; I am saying that you can't judge a Con in conventional ways by its attendance numbers. From instance, most of the artists, writers and retailers I've spoken to were vastly disappointed in their Phoenix Comicon sales - the attendees were not their typical fans and customers. I say this not to be mean, but to gently correct the recent suggestions that Phoenix is at par with NYCC and SDCC. You can see my past reviews here. The struggle over volunteering and other past PHXCC challenges - like the badge system going down last year and thousands of people being kept outside in 117 degree heat, some of whom required medical attention - are typical of Cons that grow very quickly. Bigger Cons have had the luxury of learning over many years, or they got snapped up by organizations like ReedPOP that know how to handle logistics more smoothly. This Con has doubled in size in the last 3 years. They're going to make missteps and adopt strategies not everyone agrees with. However, the acrimony of this particular debacle suggests to me that we will see significant change over the next few years - either with a new organization/event, or a regime change. Much has been made of Phoenix being one of the poorest cities in the nation, with almost 1 out of 6 people beneath the poverty level. Say it isn't so! Oh wait, that actually lines up with much of America. People know that about 1 in 5 American children are beneath the poverty level, right? Forgive my bitterness, but I'm not sure why people who normally overlook real poverty issues - like going hungry or forgoing medical care - are suddenly concerned when it comes to spending $20 for a Con badge. Don't get me wrong; I want everyone to be able to afford to go to Comic-Con. But given that you'll spend that much on a parking garage each day for this Con, I have a hard time seeing this as a massive financial burden. Of course, it's a bigger deal for broke attendees who count on volunteering to cover their badge, and now will have to shell out almost $100 for the whole shebang. Unfortunately, this is an issue at every Con: you can't count on volunteering for a free ride in most cases. That said, I'm not sure that paying $20 is going to make a volunteer stick around. People don't volunteer at Cons just to save money. Some people like being behind the scenes, some are looking for a way to meet other people or chat up hot cosplayers, and some people feel a sense of contribution in putting on a great community event. And it's likely that a lot of the people who flake out on their shift are just bored, irresponsible, got invited to happy hour, have a panel they don't want to miss, etc. I understand the problem the Con is trying to solve - I just think there are better solutions, like compensating someone for their badge after they complete their volunteer shifts. Hardship cases can have their own process. While the media attention around this has intensified in this last week, I'm told by BRA members that the policy itself is not a sudden decision and has been brewing for a while. This isn't a one-off issue. Other Cons have struggled to compensate volunteers fairly - check out ECCC's class action lawsuit. I don't think this is an easy issue to resolve, unless Square Egg Entertainment (PHXCC's owner) wins the lottery and is flush enough to pay their volunteers - and monitor them closely. Even then, as Comic Con culture continues to swell, we'll see this arising in other convention and fan organizations. Why can't they just ovetstaff the volunteer force to cover the ones who don't show up? Sounds like it's going to be based on who you know now. They give out complimentary badges to volunteers, which means they have to cap it at some point.